, all content and opinions expressed here are my own. When you are a B2B business, it is important to keep up a steady stream of communication with your customers. One great way to do that is to send them business Christmas cards. It gives you a great reason to touch base and do some business relationship maintenance. 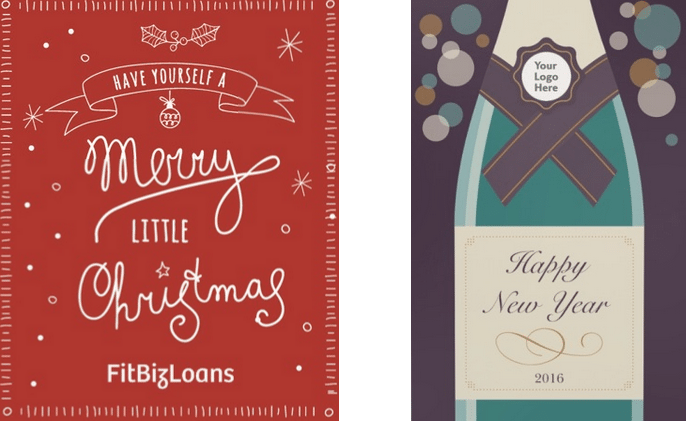 Here’s a start-to-finish guide for creating a stellar B2B Christmas or Holiday card. There are three basic costs associated with business Christmas cards: design, printing, and postage. If you use a design and print service, like Vistaprint, costs are generally more economical. Per card, you can expect to spend around $1.50-$2.25, depending on the kind of card you get (folded vs. postcard, etc), that’s including the cost for a $.49 Forever stamp (see step 6 below). So to figure out your approximate cost estimate, you simply take the number of B2B contacts you want to send a card to and multiply by $1.50 for your low end estimate and $2.25 for your high end. If you already have a budget in-place, knowing the cost-per-card makes figuring out your list-size a breeze. Just take your budget total, say $500, and divide by your low end and high end estimate. Using this formula, with a budget of $500, you could send out between 222 ($2.25/card) and 333 (at $1.50) cards. Deciding what you want to accomplish with your cards is an important first step. It can really help you later on when you are narrowing down your list and working on your message and design. There can be a lot different reasons to send out a card. Also, cards can certainly accomplish more than one purpose at a time. But having an overall focus helps the process moving forward as you design your business Christmas cards, put together your contact list, and send cards out. To Thank the Customer – This card does not have a pitch, it is just thanking B2B customers for their business. It is similar to the reestablishing contact card, but the message is different. To Spread the Word About Your Business – One great way is to send cards out to prominent media companies in your local area, key industry suppliers, important industry participants such as bloggers and analysts, etc, potential referral sources, and others who have influence in your area or industry. Now you have to figure out who exactly to send your cards to and make an official contact list. If you only have 100 clients, you can probably afford to send a card to all of them, making your decision simple. If you have hundreds of thousands of clients, you may have to be more selective. Here are some effective strategies for creating your Christmas card list. B2B Clients or Possible Clients that Have Significant Contract Potential – Let’s say you have 500 clients but only 75 of those account for 50% of your business contracts. You also know of around 25 other clients that are considering expanding on their current contracts. Prioritizing those 100 contacts, your bread and butter, is a solid strategy. Get Your Sales People Involved – Another way to craft a quick and quality list, is to go your sales people and have them each give you the names of 20-30 businesses that they think could benefit most from a holiday card, whether that be existing or potential clients. For most small businesses, using a design and print service like Vistaprint is the best, quickest, and cheapest option. Vistaprint has a lot of great designs, the key is to find one that looks good and makes sense for your business. If you want to go for a more fun or quirky card, here are a few options that are more whimsical but still look good. Something like the card below would probably be a better fit. It’s simple, professional, and to the point. It says: “We are trustworthy, steady, and high quality” In other words, try to match the design of your card to your brand and brand message. Use a High Quality Camera or Hire a Photographer – The whole point of an image, is to add something to your card. If the image is even slightly out of focus or grainy, it becomes a liability instead of an asset. Use a high-quality camera like a DSLR or hire a professional. Avoid Stock Imagery – If at all possible, avoid stock imagery. 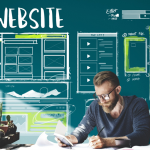 Using an actual photo of your business is appreciated by people and highlights the fact that you are local and have a personal relationship with your B2B customers. 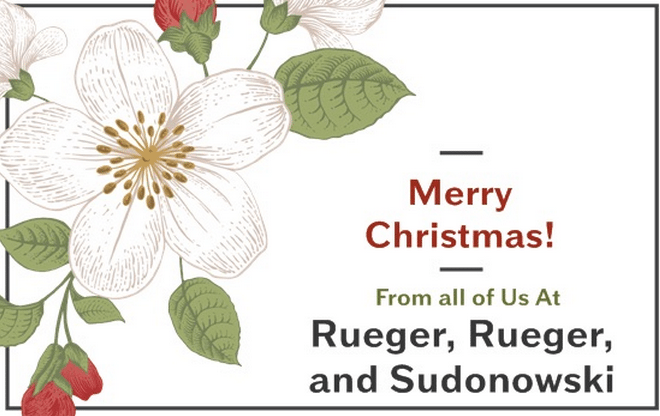 Use a Photo that Furthers Your Brand and Your Card Message – For the law firm example above, a photo of Rueger, Rueger, and Sudonowski in Elf costumes and Santa hats is probably inadvisable. However, one of them together in their suites would be great. Or, a picture of them with a local client they recently represented, either during proceedings or after, would also be a good idea. Blank space is good for a variety of reasons. First, it makes your card look less cluttered. Second, it helps highlight the things that are important, like the text, images, etc. Third, you need to leave some blank space for writing a personal message. But, when it comes the handwritten message, things get a little trickier. 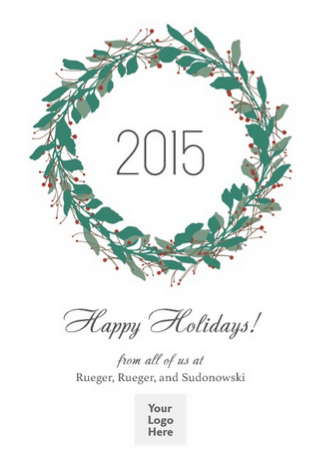 Here are some tips to crafting a good handwritten message for your holiday card. Keep it around 3-5 sentences – The point of this kind of B2B holiday card is to touch base, not catch up or tell a long story. Keep it short, relatively simple, and concise. Make it Purposeful – Just because it is short, does not mean your message is pointless. Don’t forget your purpose for the card and try to work it tastefully into your message. Make it Personal – Most of the time a holiday card will be to a business owner or executive or that you know personally. Make sure you highlight that. Make a positive comment about the last time you got together or something that reinforces the personal connection. People often overlook the signature, but it can be awkward. Here are some solid signature options that won’t let you down. “Ciao” – A heart-warming movie about an Alaskan dog? “See You Soon” – Will you, will you really? Step 6: Address Your Cards, Buy Your Stamps, and Send Them Off! You are almost done! But, do not overlook the importance of the last final steps of the business Christmas card creation process. They can say a lot about your business and have a significant effect on how well your cards are perceived by your B2B contacts. Although it can be a real pain, addressing your cards by hand can make a big difference in the way they are perceived upon arrival. A handwritten address says “personal” much more than a sticker or label does. If you have a to use a pre-addressed label to save time, use one for your return address but handwrite the address to which the card is being sent. 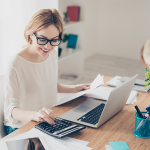 Don’t feel like you have to do these all yourself, make it a team effort or have your secretary address them over a period of time. A good rule of thumb, is to get your business Christmas cards in the mail by no later than the second week in December. Post Offices get crazy busy during the holidays and if you send it later than that, you are risking a late delivery. Better to be early than late.